The Kansas City Chiefs are the toast of the town right now; they are the team to beat. That designation does not belong to the New EnglandPatriots anymore (at least not right now). But the Baltimore Ravens showed the world that the mighty Chiefs are not unbeatable. But could a team with a better offense and a pretty good defense take down the mighty Chiefs? Someone like the Los Angeles Chargers,perhaps? So far, it seems like the Chiefs run game is going to be just fine without Kareem Hunt. Four ball carriers combined for 174 yards on the ground against the woeful Raiders. Last week, the team had only 94-total against the Ravens and their top-three run defense. But Spencer Ware did have 75 yards on 15 carries for a very respectable five yards a carry. So, maybe there is hope for the Chiefs run game still. Not that it really matters as long as Patrick Mahomes stays healthy. The Ravens were supposed to have one of the best pass defenses in the league. But Mahomes torched them for 377 yards and a pair of touchdowns. The offense only scored 27 points (low considering they scored 40 and 51 the previous two weeks). But the Ravens did have the right formula. Defeating the Chiefs can be done if outscore them like the Patriots and Rams did. It can also be done with defense but only if a team has a dynamic offense (which the Ravens do not). Philip Rivers is still one of the best in the league and is having one of the best years of his career at the tender young age of 37. 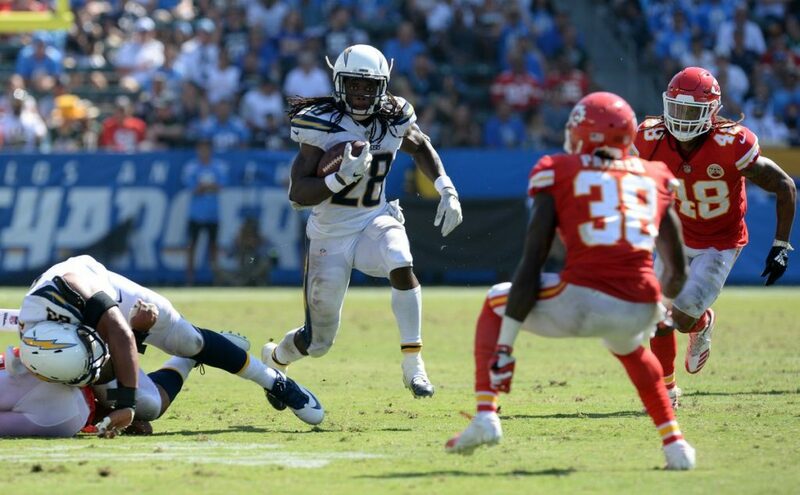 He should have Melvin Gordon in the backfield again this week giving the Chargers the necessary run game. But what about their defense? They are a top ten team in yards/game allowed, the No. 7 defense against the pass, and No. 6 in points allowed (20.8). But will it be enough? For the Chargers to win, they have to play well in every facet of the game. They can’t let the Chiefs run the ball and they have to keep Mahomes from having a big night. To help the defense out, the Chargers need togo on a few long, sustained scoring drives—touchdown drives (you can’t beat theChiefs kicking field goals). The less time Mahomes spends on the field, the better. Do the Chargers have the personnel to get the job done? It will be a close game and a very hard fought one. If the Chiefs were to win, it would not be shocking. But if you are willing to take a chance, take the Chargers to win. If you don’t want to do it straight up, take thepoints (3.5) because the Chiefs will not win this one by more than three. As for the over/under—does it need to be said? Take the over (53).